I prewash my quilting fabrics to avoid shrinkage that can occur when a quilt is washed the first time and to remove the sizing and other chemicals that are added to the fabric when it's manufactured. But fraying (lots of loose strings) is a common problem when prewashing quilting fabric. High-efficiency washing machines, without agitators, reduce the problem, but they don't entirely eliminate frays. Why Are Frays a Problem? Fraying threads can clump together to twist and pull at the fabric, distorting grain, and even wrap around yardages, bunching them into knots. The loose strings and knots must be removed before fabrics are placed into the dryer. Leave the threads in place and I guarantee that you'll see oodles of accordion pleats when fabrics are dry and that the folds won't be easy to remove when you press the fabrics before use. 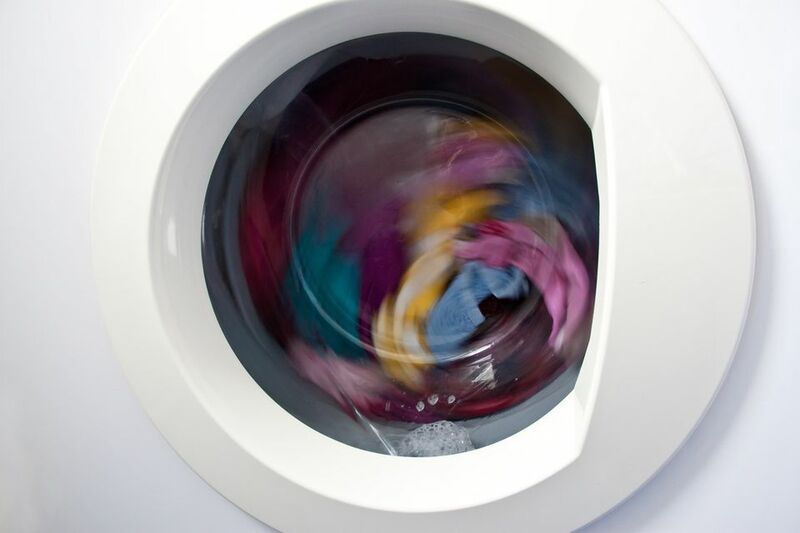 It's easy to eliminate much of the fraying that occurs in the wash by clipping a little triangular piece from each corner of a fabric before you put it into the washing machine. Try to clip about 1/2" or a little less. You'll still see a bit of fraying, but not enough to create lots of problems. Give this easy method a try the next time you prewash your quilting fabrics -- the little snip really makes a difference. Narrow cuts of fabric, such as 1/8 and 1/4 yards, usually fray and twist more than longer yardages. Even fat quarters and fat eighths can fray enough to reduce the amount of usable fabric. Give the snipping technique a try with those types of cuts, but if you experience fraying and twisting, consider either hand washing the next batch or choosing a delicate cycle on your washing machine. Brand new fabric shouldn't be dirty so a series of simple swirls in soapy water should do the trick. Wear gloves to hand wash if you're using a typical laundry detergent. For a more gentle washing solution, make your own laundry soaps. Try Orvus Paste, which is available online and from many local fabric and quilt shops. Many quilters love Orvus Paste but do keep in mind that it is a detergent, not a soap. A few more of my fabric tutorials might be of help when you make quilts. How to Do a Burn Test to Identify Fabrics Most quilters prefer 100 percent cotton fabrics. Always check fiber content when you buy fabrics at a yard or estate sale, or when non-quilting friends gift you with fabric. Try a Bleed Test to Check for Unstable Dyes in Fabric It's always essential to know if a fabric will bleed -- lose its dyes -- in the wash.
Get the facts about fabric grain before you cut fabric for a quilt. Patches that are cut incorrectly can stretch out of shape as you work with them, creating a quilt top that's skewed out of shape.